Earlier this month, one of the world’s most iconic buildings went public as a REIT. The Empire State Building and several smaller properties totaling 7.68 million rentable square feet were combined to form Empire State Realty Trust, Inc. The ticker is ESRT. My purpose here today is not to examine the company’s valuation, or discuss its investment potential. (I’ll leave that to REIT specialists. The Empire State Building’s high vacancy rate and the ongoing and expensive renovations complicate the analysis.) The REIT may be cheap, dear, or fairly valued. What I am here to discuss is how a quirk of the formation process allows investors to buy identical claims on the REIT’s assets at discounts to the market price of 10% or more. Prior to the IPO, the ownership structure of the Empire State Building and the trust’s other properties was positively byzantine. Individuals, partnerships, estates, individuals and corporations all owned bits and pieces of the various properties. In order to go public, dozens and dozens of separate owners had to be convinced to vote in favor of the transaction, which would result in them contributing their stakes in return for ownership in the new structure. The process was both lengthy and litigious, but ultimately successful. Post-IPO, the newly-formed company’s ownership structure is still somewhat convoluted. All of the properties are owned by Empire State Realty OP, LP. This partnership is owned, in turn, by management, Empire State Realty Trust, Inc., and continuing investors who have received LP units in exchange for their stakes in the original ownership structures. Here’s an ownership chart, adapted from the prospectus and adjusted for the over-allotment option which was fully subscribed. 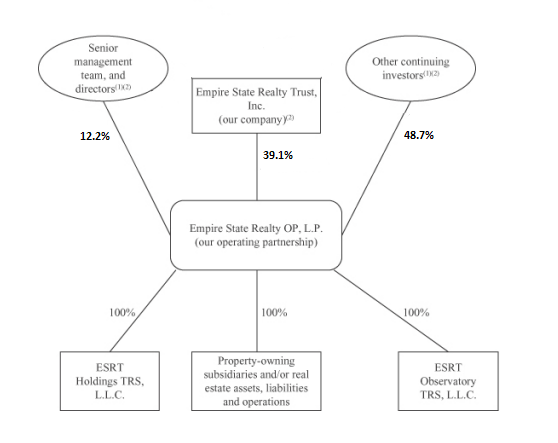 Again, Empire State Realty Trust, Inc. is the public REIT while Empire State Realty OP, L.P. is the partnership that owns all of the properties. In simple terms, this chart shows how little of the operating partnership that the public REIT actually owns, just 39.1%. Continuing investors hold a sizable ownership stake, nearly half of the operating partnership’s units. These operating partnership units not owned by the public REIT or management present the opportunity. The partnership units consist of three different series, all of which are publicly traded. The only substantive difference between these operating units and shares of the REIT is voting rights, and the fact that they can be exchanged at the REIT’s option. Because their economic value is identical, the prices of these operating units ought to track the prices of the REIT very closely, with perhaps a small discount for the lack of voting rights. Instead, the units are currently trading at a substantial discount to Empire State Realty Trust, Inc.’s share price. Discounts on the operating units range from nearly 7% to nearly 15%, based on last trades. Trading in the units has been erratic, with the Series ES units changing hands at $82.00 on October 9 and 10, roughly six times the value of the the REIT’s shares. While the current discounts offered may be attractive, a larger opportunity could arise when the lockup period on these units expires. Holders of the Series ES, 60, and 250 units are currently prohibited from collectively selling more than the greater of 1.1 million units or $40 million worth of Series ES units, and their same proportional holdings of the series 60 and 250 units. $40 million worth of Series ES units equates to 3.08 million units at the REIT IPO price of $13. There are 46.22 million Series ES units outstanding, so owners may sell 6.67% of their Series ES, 60, and 250 units are any time. The next substantial lockup expiration comes 180 days after the IPO, when owners may sell up to 50% of their holdings. Lockup restrictions expire completely after one year. I’ve made a simple chart to summarize the lockup calendar. Presently, only a little more than $60 million worth of operating units can be sold, but this amount will balloon to over $450 million at the beginning of April, 2014. If the market is suddenly flooded with units, the discounts to the REIT price may blow out. Investors should monitor the trading prices of these operating partnership units in order to take advantage of potential market dislocations caused by motivated sellers or an influx of newly tradable units. Investors who are bullish on Empire State Realty, Inc. could simply buy whichever operating unit offers the biggest discount to the REIT, while investors who are agnostic or bearish on the REIT could easily hedge the trade by purchasing the operating partnership units and shorting the REIT shares. I must emphasize that the operating partnership units trade at extremely low volumes, and investors should exercise caution in buying or selling. No position, but monitoring the situation. How on the earth did you find this out? A great piece of detective work…let us get into your brain a little…please let me know…wow. I read on whopperinvestments via brooklyn investor about “Phil Goldstein” and how he manages to eke out a 5-10% gain over the indices (their speciality is closed-end funds trading at a discount to NAV). There are parallels. How did this come on your radar? How much time did you have to spend to unearth this info and pen it? Please write. Thank you, i will add this to my watchlist. When it comes to investing, I don’t have any secret formulas or new advanced valuation methods. What I do have is the willingness and desire to spend a lot of time “turning over rocks” and reading up on securities with which I am unfamiliar. I spend probably dozens of hours each week reading securities filings and seeking out new companies, learning about them as I go. I noticed the operating partnership units when I was scanning the day’s biggest movers after the close one day last week. My interest is always piqued when I see an unfamiliar ticker making a big move on minimal volume. There is money to be made in monitoring discounts and premiums and trading accordingly. It may not be the most exciting investing style, but it works. I believe you made a mistake because the op units may not be sold in 6 months only the class a stock. Most of the market cap is in op units so I think the flood will be on October 1. Op units cannot be exchanged until one year after. Thanks for your comment. Here is the section of the prospectus that describes investors’ ability to sell 50% of their operating partnership units after 180 days. Page 21 if anyone would like to view it directly. Any idea what caused these units to trade so far above fair vale for days? Was it an honest mistake, or a few wise guys painting the tape, trying to get suckers to overpay? Though I’m not sure, my sense is it was only some uninformed buyers using market orders. Volume was very low, which suggests retail activity. agree that the lockup period expiration would result in selling pressure and discounted secondary issuances. but wouldnt the substantially improved liquidity eventually result in closer realization of fair value? my understanding is OpCo units are sold at a discount largely due to illiquid nature of the securities. I expected to thank you for this unfathomable read!! I irrefutably getting a charge out of every single bit of it I have you bookmarked to take a gander at new stuff you post.